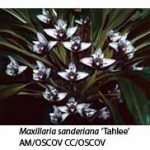 H. Ruiz and J. Pavon described the genus Maxillaria in their Prodromus Florae Peruvianae et Chilensis in 1794. 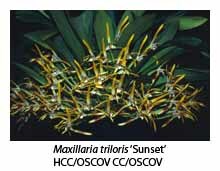 Whilst no recent revision of the genus has been made, many of the species originally described as maxillarias have since been moved to allied genera, such as Lycaste and Xylobium. The genus is currently stated to consist of about 300 species. 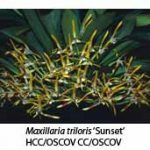 Maxillarias are widespread throughout Central America, where they usually grow as epiphytes or lithophytes, seldom as terrestrials. Their range extends from southern Florida and Mexico through the West Indies and Central America as far south as Argentina. 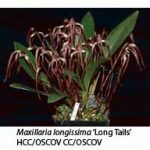 The genus is particularly well developed in Brazil and the Andes, and is found at all altitudes from sea level to 3000 m. With such a large range (both geographical and altitudinal), maxillaria plants vary widely in size and vegetative habit; some prefer cool conditions, others hot. Maxillarias always bear solitary flowers on relatively short scapes that usually emerge from the base of the pseudo-bulb, although some emanate from a leaf axil. In many cases the inflorescences are produced so prolifically that the flowers obscure the plant. 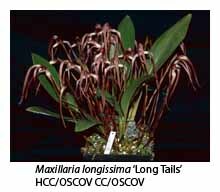 Flower size ranges from about 8 mm across to more than 125 mm (in the case of Maxillaria sanderiana). Flower colour ranges from pure white through gentle reds and browns to near black. The genus as a whole shares some common cultural requirements. All species seem to prefer bright light (but not full sunlight), high humidity, good air circulation and regular applications of weak liquid fertiliser. The plants should never be allowed to become “bone dry” but good drainage is essential. Most dislike being divided and show their displeasure by refusing to bloom for a year or two. Maxillaria lepidota. An Andean plant found at altitudes of 1500-2000 m, and therefore requiring a cool, moist atmosphere in cultivation. Maxillaria nigrescens has fairly large blooms (80 mm across). As this species is found in Venezuelan and Colombian rainforests at altitudes of 1500-2500 m, it requires no heat here. 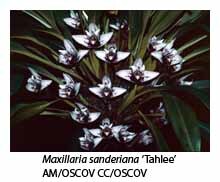 Maxillaria ochroleuca is found at high altitudes in Brazil and Venezuela. Its flowers, which are only about 30 mm across and don’t open widely, are borne on short peduncles that develop from the base of the pseudo-bulbs. Maxillaria porphyrostele. Although this species is found at low to moderate altitudes in Brazil, many have found that it grows and flowers well without heat in Melbourne. It bears yellow flowers on short peduncles. Maxillaria sanderiana, together with M. striata and M. grandiflora, probably represent the largest-flowered members of the genus. M. sanderiana is found in Ecuador at altitudes from 1200 to 2400 m. Its flowers can measure up to 125 mm across, and are ivory white with deep red staining in the throat. It’s best grown in a basket or on a raft. Maxillaria striata, a native of Ecuador and Peru, if found at altitudes of 700-1400 m. Despite the lower altitudes at which it grows, it should be treated in the same way as M. sanderiana. Maxillaria grandiflora is found in cloud forest in Colombia, Peru and Bolivia at altitudes of 2500-3000 m, and has similar cultural requirements to M. sanderiana. Some form of cooling may be beneficial for these two species in Victoria during summer.